If you're looking for cooking inspiration this holiday season, then look no further than Goodbye Gluten, the gorgeous new gluten free cookbook by Sally Holland of Tauranga, New Zealand. Sally has no shortage of experience with food having worked in the New Zealand Woman's weekly test kitchen under iconic food editor Tui Flower. Sally had to reinvent gluten free versions of her favourite recipes after her husband was diagnosed with coeliac disease several years ago. Goodbye Gluten is a collection of her gluten free recipes. Sally's team kindly sent me a copy of Goodbye Gluten to review. 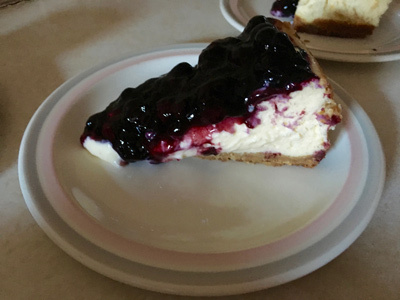 The same week, I had been invited to visit some friends for dinner so decided to make the New York style cheesecake with blueberry sauce. I must admit to being a bit nervous as I have never made a cheesecake before but as the photo suggests, the result was fantastic. Smooth and creamy, the slightly sour filling was well balanced against the sweet blueberry sauce and buttery biscuit base. It reminded me of cheesecakes that I've tasted in restaurants and my (non-coeliac) friends were delighted. 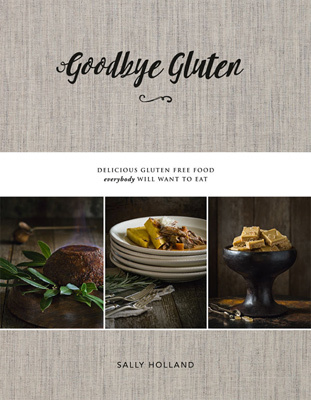 Goodbye Gluten is beautifully laid out with stunning full page colour photos of every recipe. Like many gluten free recipe books, the author uses a flour blend throughout the book. Thankfully, the flour blend in Goodbye Gluten is simpler than many others and uses the more common gluten free flours - I already had all of the ingredients in my pantry. As you would expect, Goodbye Gluten's 90 recipes span the usual sections on baking, appetisers, meals, desserts. But rather than stop there, Sally has also included special chapters dedicated to Christmas foods and childrens birthday parties. I know these will prove popular with our readers and I'm really looking forward to trying out the Christmas mince pies! This book is printed on good quality stock and bound with a sturdy hard back and would make a great addition to any kitchen.